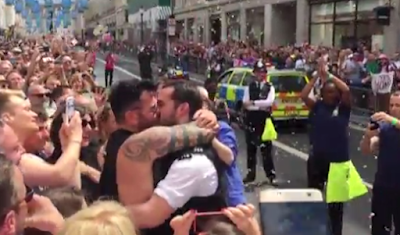 A police officer who proposed to his boyfriend last year at London's Gay Pride has said he regretted his decision to make a public proposal after the video went viral and hateful comments followed, with some wishing them dead. 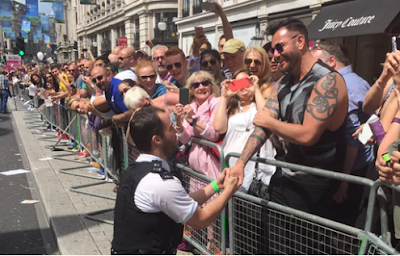 PC Phil Adlem shocked his boyfriend and the thousands of people present at the Gay Pride event when he stepped away from his duties, went down on one knee and popped the question. His partner replied in the affirmative and they shared a romantic kiss in front of the cheering crowd. Videos of the romantic proposal quickly spread online and so did the hate comments. Writing for The Guardian, Phil now admits he wished he never made the public proposal due to the shocking abuse he has faced online. He said the immediate responses were positive and warm but when he went online the vile comments wiped the smile off his face. "I looked through the online comments from the British public. Most were fantastic. But my smile did not last long as I continued reading." He found comments that were downright homophobic and some that were simply too vile to be repeated. "Both should be hanged till death," one comment read and another went: "don't blame ISIS if they strike them".He was offered media interviews but turned them all down as a result of the hateful comments. It was no better at work as Phil became the recipient of hate from a colleague, causing him to regret proposing in public. "A further hostile reaction at work from one of my colleagues and another from an old college friend was enough for me to wish I had never done it. "Phil, who is a speaker for an LGBT charity, also revealed he was subjected to a brutal homophobic attack on his 18th birthday. "Despite all this, I know I am lucky. I am lucky to live in a time when I can join the police service as an openly gay man – and I have previous generations to thank for that. But even among young people in Britain today, my story is far from unique.